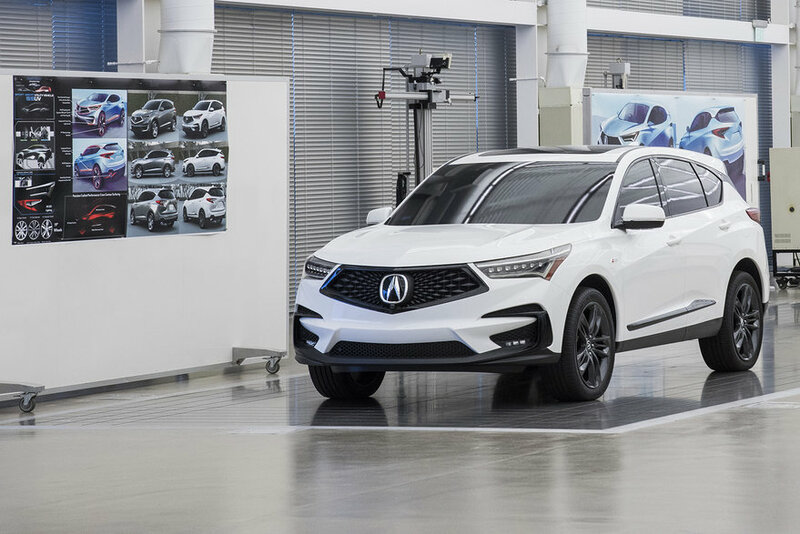 At the Acura Design Studio we were granted an in-depth look at how all of the different design departments contributed to the creation of their winning RDX. For the design student that’s thinking about pursuing Transportation Design, this series should be an indispensable read. 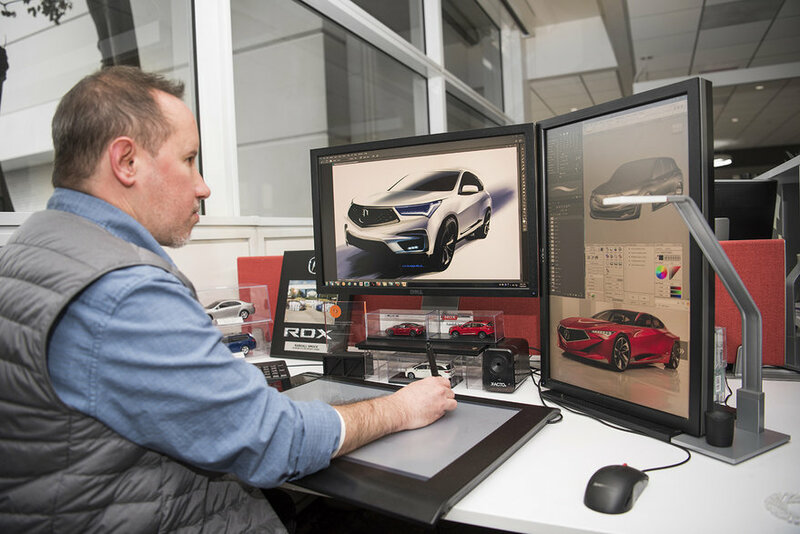 And if you’re a fan of car design or industrial design, you’ll enjoy this look at how an impossibly complicated multi-year design process all plays out. 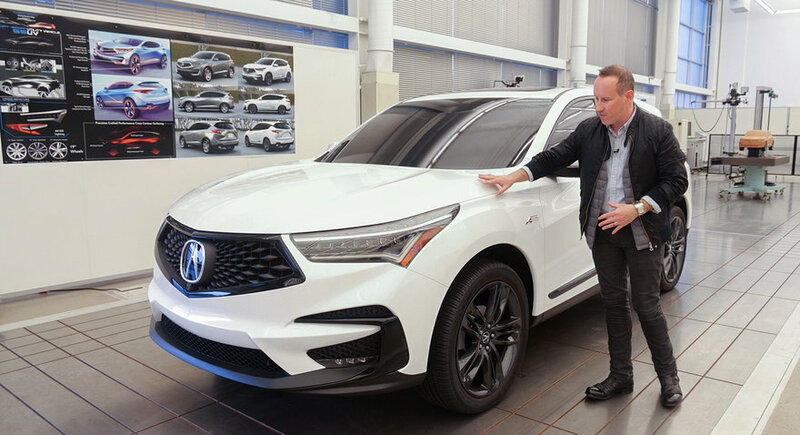 We’ll start with Randall Smock, the designer Acura tasked with translating the Precision Concept’s spirit into the new RDX. As mentioned in the first article in this series, Smock would use the Precision as the “North Star” to navigate towards the final design. 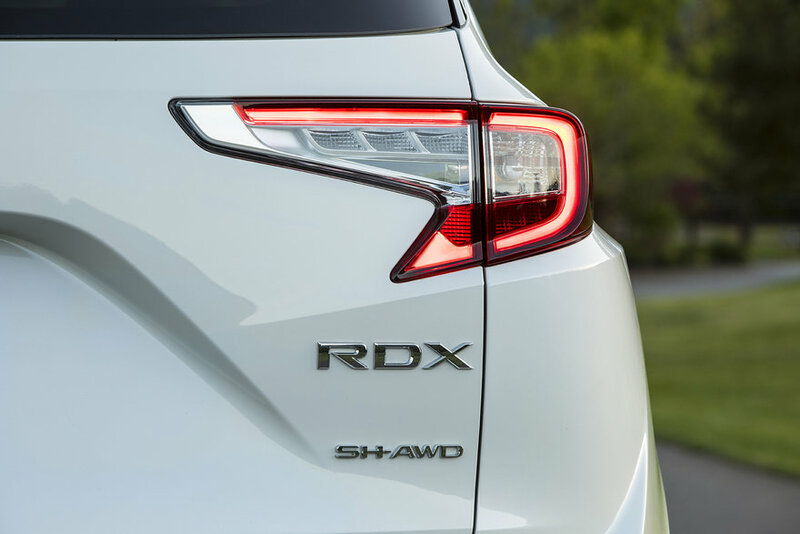 Randall Smock: I’m the exterior design leader for the RDX. 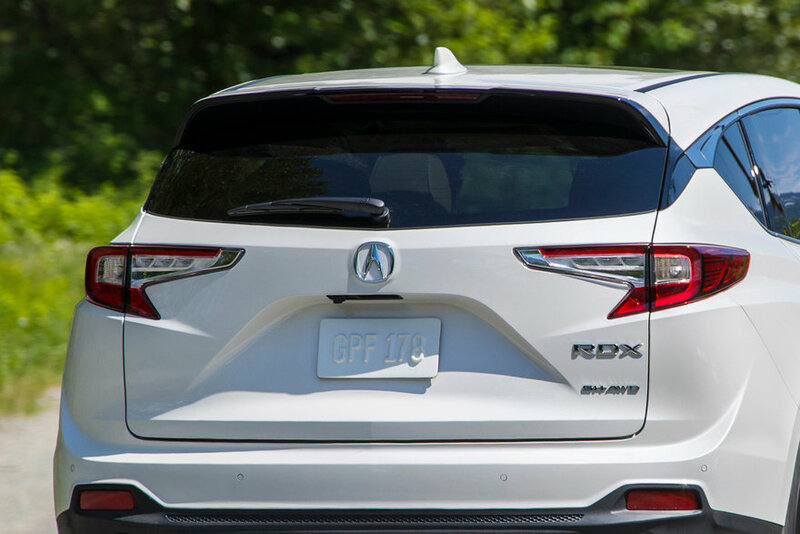 I’ve been with Acura for 18 years and had the chance to work on a bunch of stuff, but my biggest project so far is the RDX. Growing up in Arizona, I was always around cars. My father was a wholesale dealer, so he’d buy and sell cars constantly. It seemed like every day he’d pick me up from school in a different car. So I was really exposed to a lot of different types of designs and different brands. More importantly, over time I could see how cars changed–although they were considered the same model. 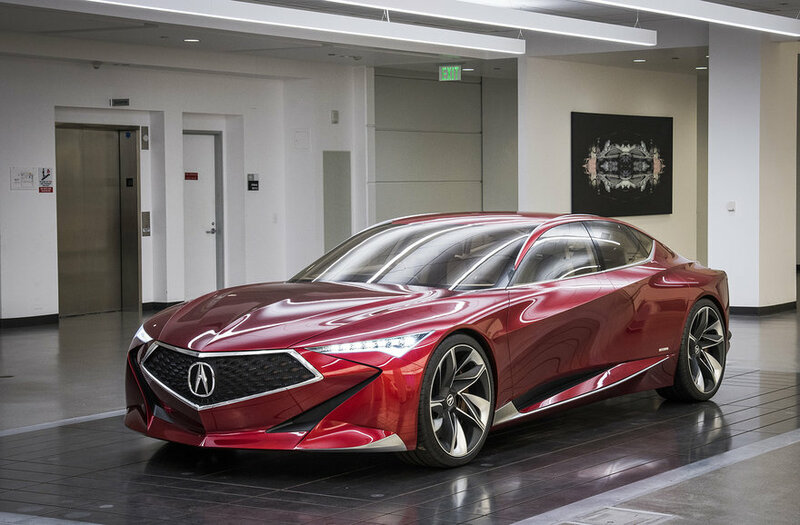 For example, I’d see a Corvette, and walk around it–“Okay, this is a Corvette”–and three or four years later, see the new model and ask “Why is it still a Corvette even though it’s changed?” So I learned about this idea of DNA in styling. I actually didn’t know that there was such a thing as car design. I knew that there was engineering, but not the idea of car styling. They actually replied back to me, with a lot of information–but most importantly, a list of schools that offered industrial design and specifically transportation design. That led me to ArtCenter College of Design here in Pasadena. So being in Arizona, it was a quick flight to L.A. I came out with my mom. We saw the student gallery and I saw quarter-scale models. I saw hand drawn renderings and my mind snapped. I said, “This is it. This what I’m going to do. This is me, I can tell.” So I had to finish high school, obviously, and went to junior college a little bit, and then made the switch to L.A. to go to ArtCenter. 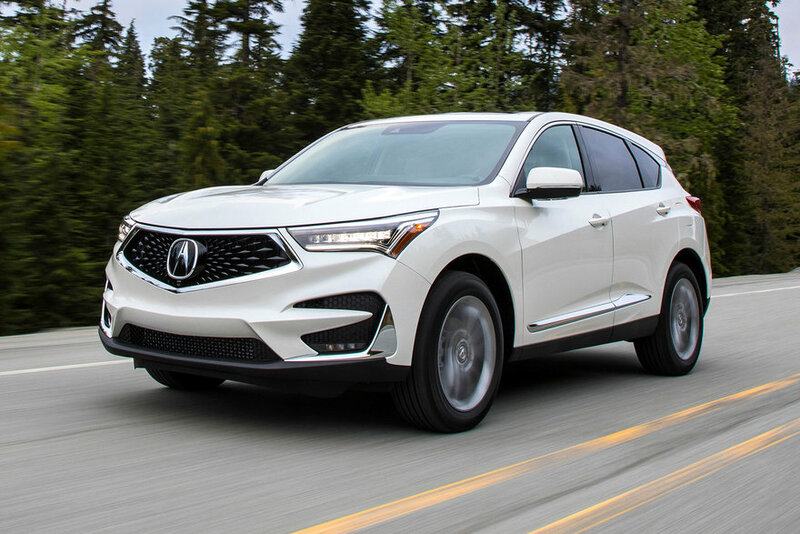 We’re very accustomed to seeing premium cars and high-end sports cars every day here, and that’s really inspirational–but it also gives you a craving, where you think “Okay, I’ve seen it. What else? What’s next?” So it kind of drives your creativity. 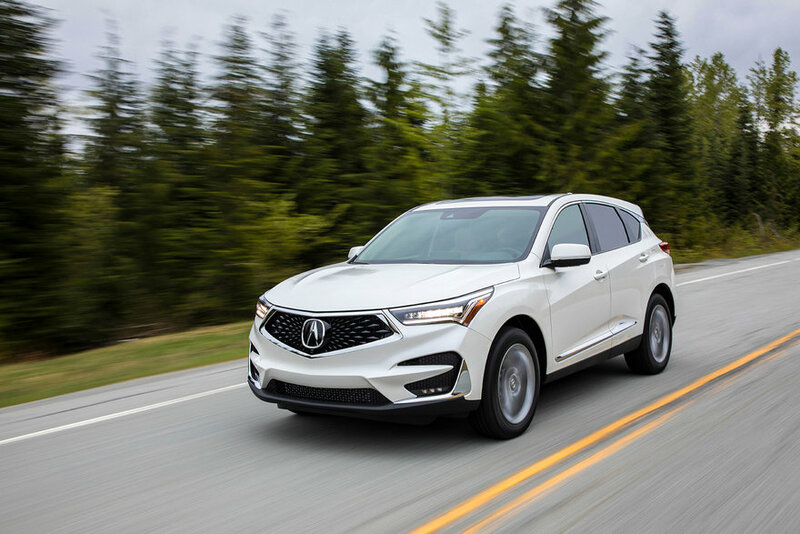 We were given the challenge to take the Precision Concept and apply it to an SUV–a daunting task, because the Precision Concept is a sports sedan and the RDX is an SUV; very different proportions. So we had to dig deep and identify that DNA that I was talking about, and fortunately the Precision Concept has very solid DNA. We wanted to think of this as a “sports sedan utility vehicle.” So “SSUV” was an internal tagline that we used for it. 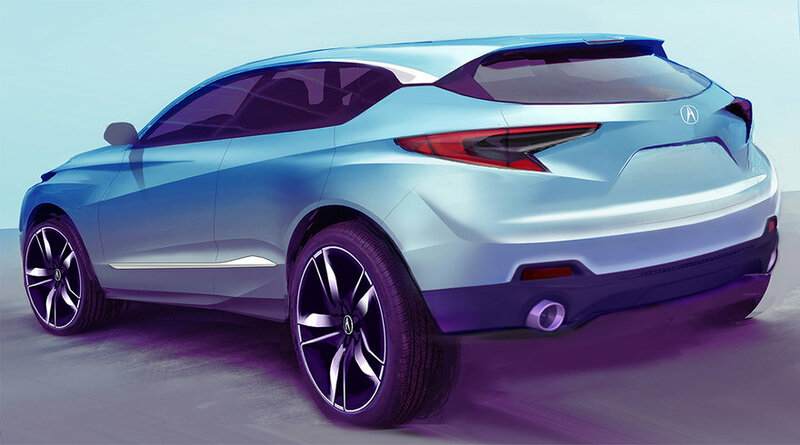 We wanted to keep the sweeping cabin, keep the cross-contour surfacing from the Precision Concept. But to apply those things to an SUV, you have to have a really solid foundation. 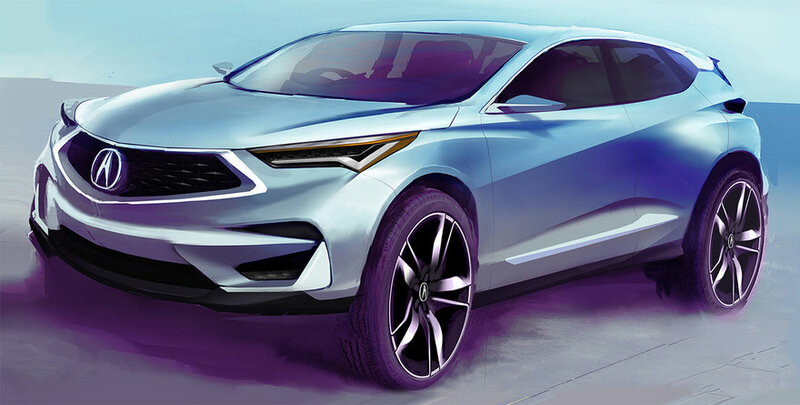 So that means the design has to be wheel- and fender-centric. All of the sculpting needs to sit very well on the wheels to make it look capable. 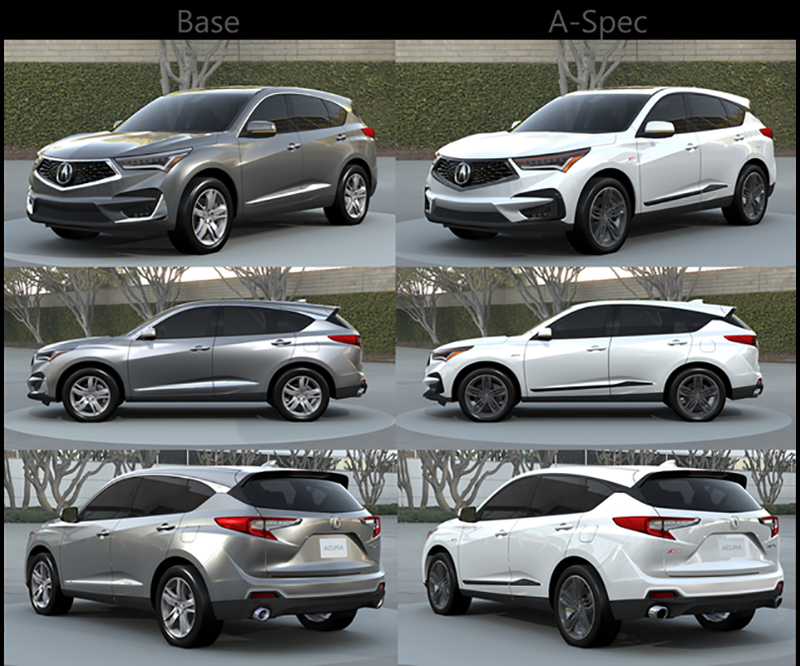 Smock’s Precision-based rendering for the RDX. This mock-up [we’re standing in front of] is what we would use later in the process. After we worked out all the feasibility numbers, we would build this, show our executives and say, “This is what we can make. We’re ready to go if you can approve this.” And they did, obviously. 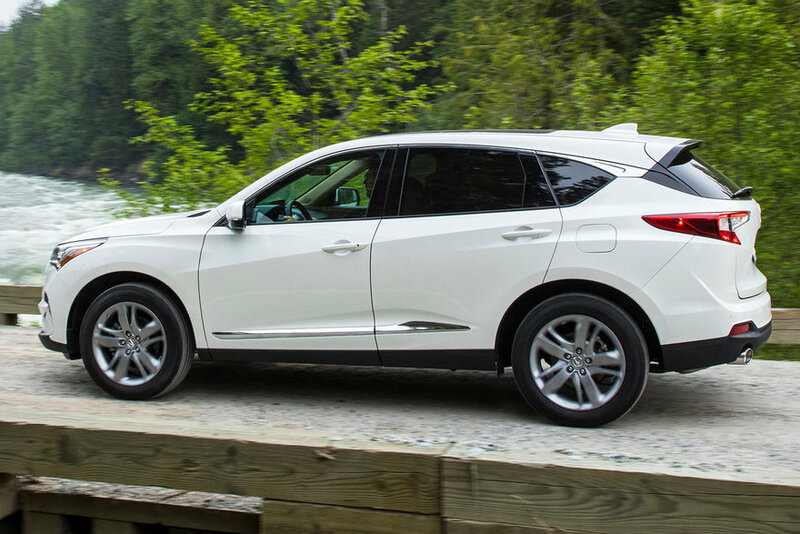 This is our achievement of taking the Precision Concept and applying it to an SUV platform. 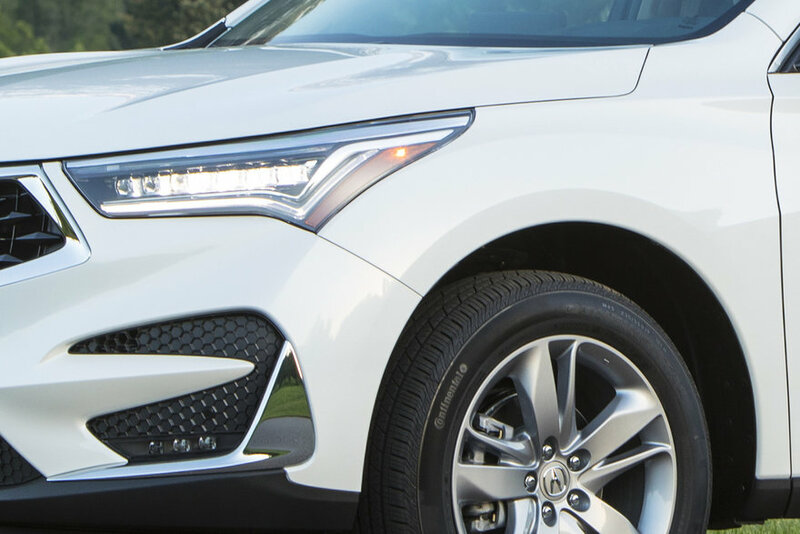 Starting with the prominent “diamond pentagon” grille. 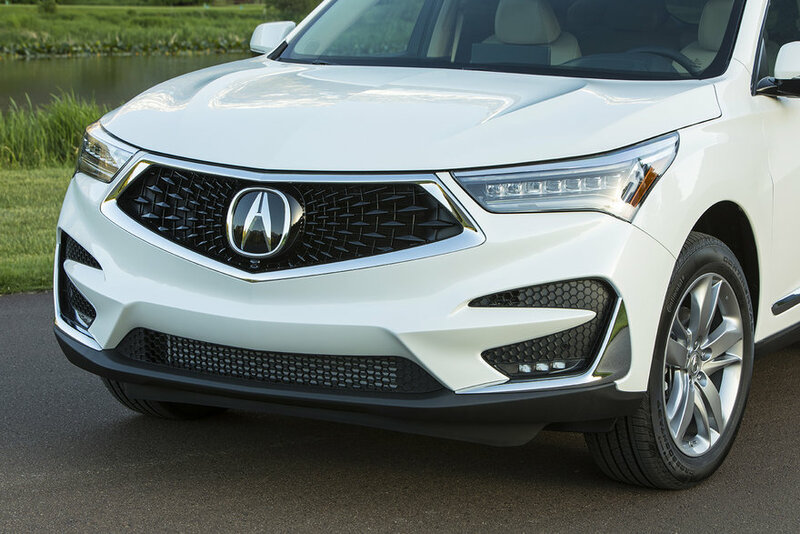 We had released [the grille] to the public already in the MDX, mid-cycle, but this time we could design the whole car with this in mind. 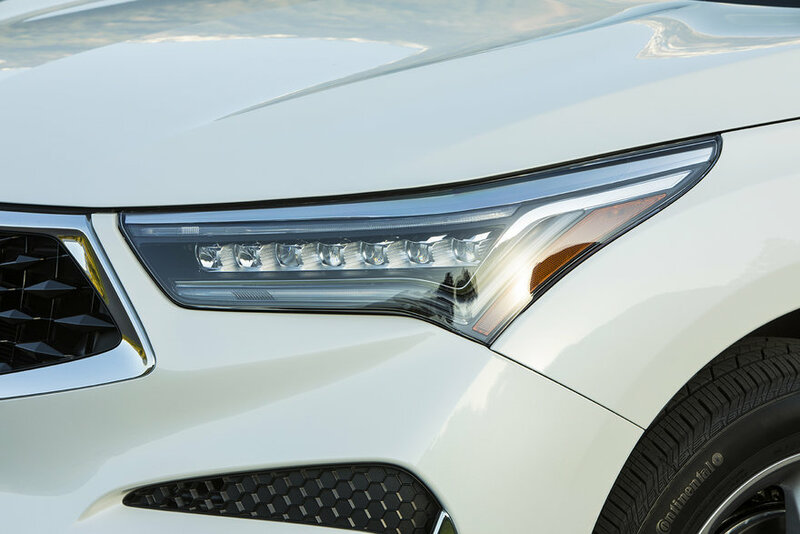 You can see the car really grows from this grill, whether it’s the lines in the hood going from the corners, or the way that the jewel-eye headlights sweep and take your eyes from the center to across the car. Everything’s a connecting device taking you around the car, and that leads you [around the side of the body] into this dance of lines, that cross-contouring that we were talking about. Here’s the fender line appearing and disappearing, the strong character line of the body side bisecting it, and then going above the rear fender. So everything’s planted on the wheels. 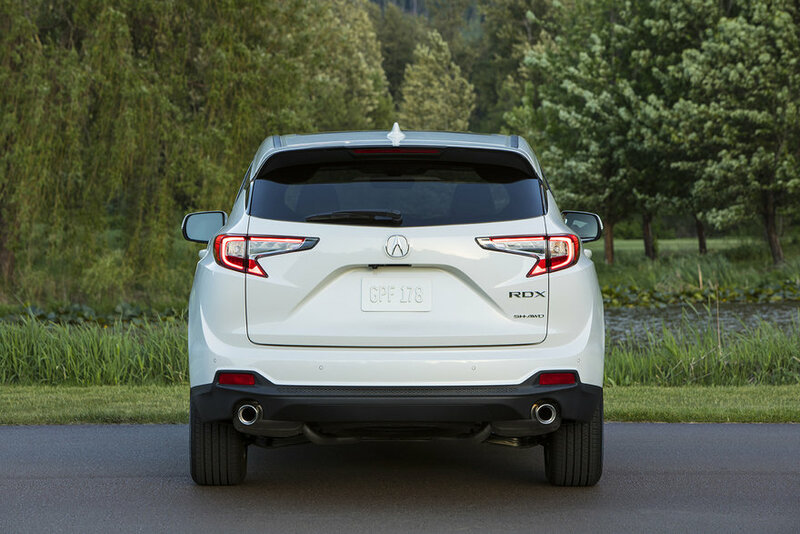 Just like on the front with the headlights, the taillights nestle very well between these character lines and continue that motion around, and this kind of leads us to what we’re calling the “dragon tail” taillight. 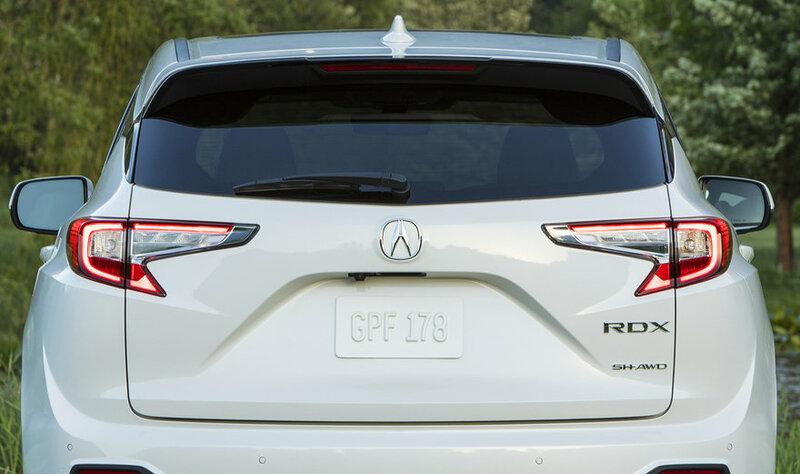 Early on in the development we actually didn’t have this [design for the taillight], we were trying to be very avant garde with it and [have the light end abruptly], but it kind of disrupted the flow and we wanted to keep that motion going. So we brought the taillight across, onto the lid. We made a literal point, a dragon tail shape, to be that final exclamation to the statement that started from the front of the car. We’re all very proud of this, and it’s doing very well [sales-wise]. We were confident with the design, and now the sales are proving the public loves it. I love it, I just got one a week ago in the white A-spec [trim]. It feels great to have been a part of it–but also to own it and experience it. 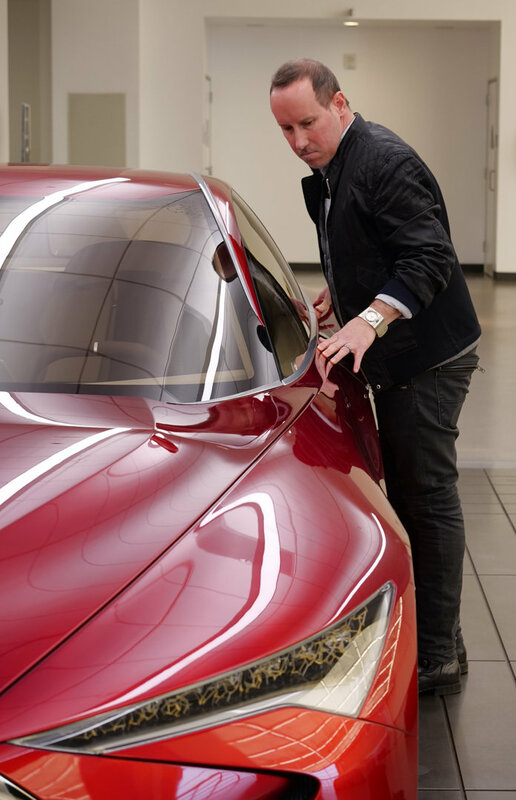 The idea is that we want to take that [awareness of manufacturability] and design that into it, rather than recklessly designing something so super sleek that there’s no chance it’s going to get made. It’s about pushing those limits: “How far can we push this, but still have everything be doable? We do come into challenges, but we fight, we push. At one point we needed to heighten the bumper beam [for safety reasons] in the front fascia. 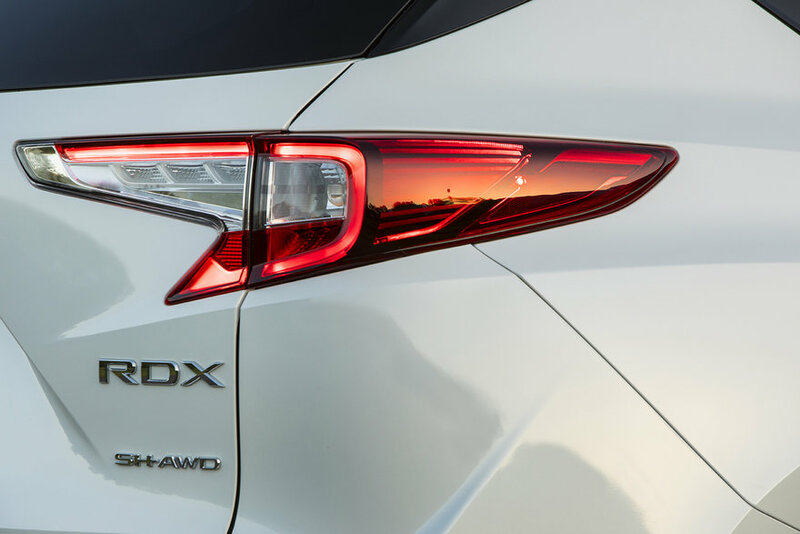 It took a while to do that [and maintain the design], but we were persistent, we said, “We’ve got to keep this aggressive sculpted front end.” We made it work. Sure, it depends on the materials you’re using, of course, steel versus aluminum, and obviously plastics open up a lot of opportunities. For example, this is a completely resin tailgate, so we could make this whole thing in one piece. 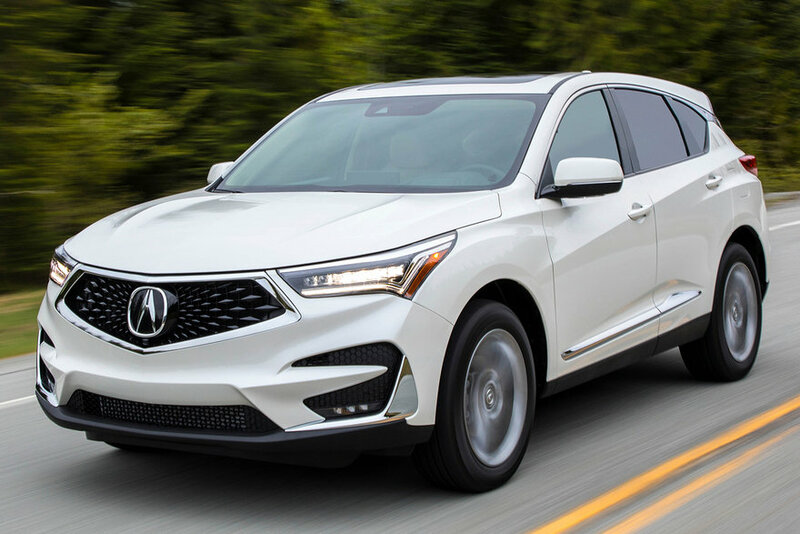 Usually you’ll see a lot of cars where, in the back here, they’ll have some kind of chrome trim or there’s an extra line in here, because it’s half-plastic and half-metal [necessitating a seam or cover-up]. This is all one piece of plastic so we can eliminate that, keep it really clean, more like the back end of an NSX. 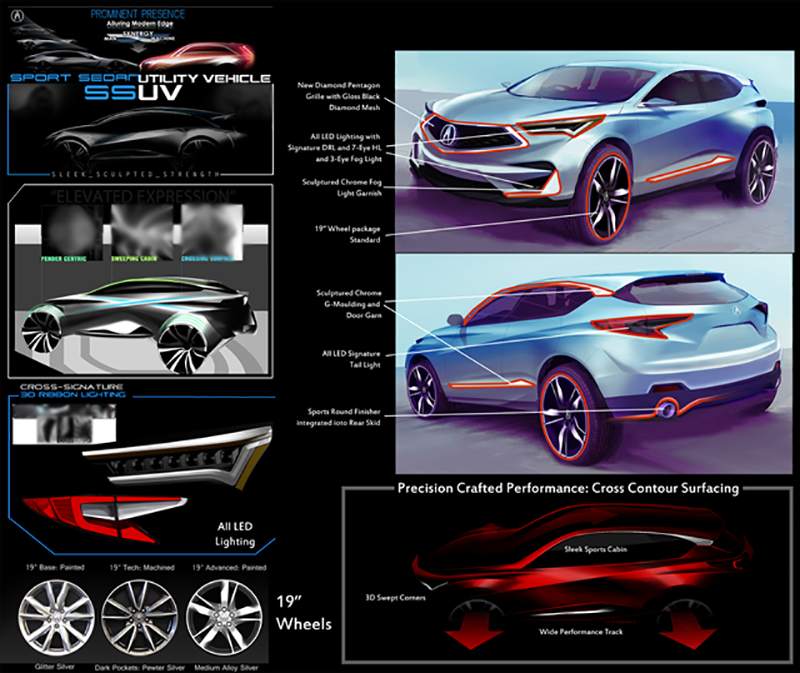 We wanted that performance car feeling and to get all of that sculpting. We couldn’t get some of these radiuses if was steel. Absolutely. On the clay model, we actually tape on where we want the lines to go. We’ll make that proposal to our engineers and they’ll come back and say, “Well, you know there’s a limit to how big the bumper is, so it can’t be up to here,” for example. And so we work within some limits, but it’s definitely our say as to where we want these. We try to design them in and there’s a reason [this cut line here] turns on that character line on the fender, rather than just mindlessly blasting straight through. –then you’d have less plastic [in one piece], but then you’d have more metal [on the adjoining piece], and then what complications or challenges does that open up? It’s a collaboration with the engineers, but in the end the designers make that proposal, and then we have a chance to tune them. Not everything in a sketch or rendering can make it to production. What’s the most challenging aspect of that? This is the best the car has looked. We started off with [all kinds of] models and mock-ups, and I think this one still looks better. There’s a lot of sculpting going on here for a very usable amount of internal space, and I have nothing to complain about on this one. I don’t feel we compromised on anything, and we completely got the proportion that we want. I enjoyed the whole process, honestly. As we kept going, it just got better and better and better. Sometimes if you do too much of an exaggerated theme early on you’re going to lose something, but again, we started with such a strong base [in the Precision Concept] all we had to do was map that onto these proportions. The whole thing was the best part. Up Next: After the Exterior Designer’s rendering is green-lit, it goes to the next phase of design, clay modeling. Stay tuned!